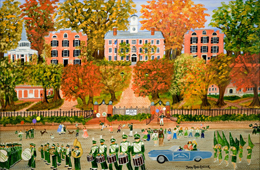 Betsy Ross Koller, an internationally acclaimed artist, donated a painting depicting the marching band in a homecominng parade passing by College Green. The profits from the sale of the prints will help support the Appalachian Scholars Program, a merit- and need- based scholarship program for students from Appalachian Ohio. Limited editions prints of the painting are available for sale on the Bobcat Store online.